Used cars are becoming a good option in India. Especially when the economy is showing no signs of recovering and rising costs of almost everything, even common salt is affecting the ability to spend at will. In this scenario, many would hark for smaller more efficient cars, even if they want a second hand one. But there is the select few who would want to get themselves a bit of status quo with cars like the Mercedes or even BMWs. But these have become almost a regular feature on the Indian roads now. However how many would have wondered about a Porsche let alone a used Porsche car in India. Even though there are a handful of Porsche cars on the road, they are finally trickling into the used car market. Now, Porsche India have recognized this untapped potential and have set up their own Porsche Approved Scheme for these used cars. Agreed that you would get such cars at a very high price than what you would get face to face with the seller, however these cars go through an 111 point check on them even before they are accepted by the company. This ensures that the customers buying these cars are safeguarded from any nasty surprises. The best thing is that you wouldn’t be left saddled with a so-called accident car with a botched up job by some road side mechanic. The Porsche Approved Scheme also offers a unlimited kilometers and 24 months warranty. Now this should really be the icing on the cake. The most affordable used Porsche car in India would be those Porsche sportscars like Caymans and Boxsters. These cars aren’t cheap by any standards however for all those gold miners, these shouldn’t be a problem. These cars retail for approximately Rs.76 lakhs when new and when they are resold, the value drops to Rs.34 lakhs. 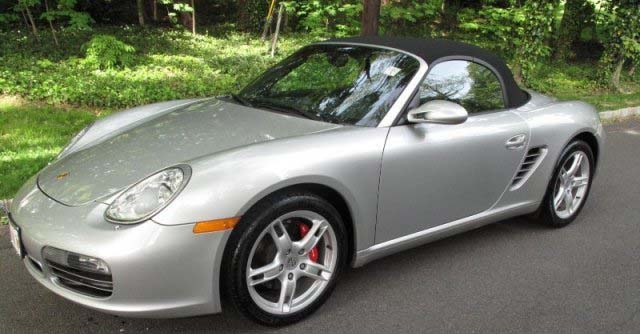 Classic example is the case of a 2006 Boxster S which we found for around Rs. 34 lakhs. If you think that the Boxster S is impractical, then a 2004 Cayenne S is been offered only for Rs.32 lakhs. And all these is been offered through the Porsche Approved Scheme. Been a Porsche, these would be ocassionally used and hence not many would have logged high kilometers. The service interval for these cars is 12 months or 10,000 kms. The servicing cost would drop one zero from the cost price of the car purchased. This is excluding the labour charges should any major work pop out. So think twice before having a minor accident with your Porsche. Rs 1.25 lakhs is the amount that you would be spending should you pringe your head lamps. The front bumper would set you back by Rs.48,000. Usual wear and tear bits like the suspension parts as well as dampers would also cost Rs 54,000. We might be scaring you but a test drive of any Porsche would have you hooked onto the car for life. We would take the case of the 2006 used Porsche Cayman S in India here. It is said to be the easiest and sweetest handling Porsche car around. Moreover it has 2 foldable trunks and is compact. Surprising is the fact that this car has covered approximately 20,000 kms. It is unusual to see Porsches with such high mileage. The other examples were 2006 models with mileage as low as 4200 kms. While one would think that buying such cars would be viable however there lies the catch. These cars would most likely have been ignored and rarely taken out even once in a month. A car lying around unused tends to be more problematic than the one which has been regularly used. A regularly used car will most likely be well cared for and would have set in the pace. However well cared or not, a car especially a used one would sprout repairs and spare part changes. Since the car has been already checked for any engine or accident damage by the Porsche authorities, the first priority would be to take a test drive. This should clear out any apprehensions of how much comfortable you are with this car. The accelerator pedal is a live wire and even part throttle should yield instant response. The brake pedal should also have a linear modulation. However over time, it would require servicing and this should cost around a total of Rs.40,000 including labor for replacing the brake pads.The inner plastics however don’t wear well if the car has been out in the sun too often. The plastics tend to melt under sunlight. The condition of plastics should also be a determining factor whether this car has been well cared for or not. Well, there is one thing that you cannot take away from a Porsche or for that matter any German car and that is its German-ness. All these cars ooze high quality cabin and attention to detail. So much so that even a brand new Honda Accord would feel tinnily built in front of these cars. A 2006 used Porsche Cayman S in India would be available without the dual clutch that Porsche so lovingly call PDK as well as the engine would be without direct injection. The steering shouldn’t be a cause of worry since it should wear on well till 50,000 kms. Speaking of the cost of spare parts, the tail light assembly goes for a cool Rs.34,500, the timing chain for Rs.12,100, front brake pad for Rs. 15,578, front shock absorber for Rs.54,708 and so on. As of now, the Porsche Approved Scheme has just started and it would take some time before operations start up in full swing. There are only 3-4 used cars available in those show rooms now. At approximately the same prices, you can get a brand new Mercedes E class, BMW 5 series or the Audi A6 but then the exclusivity factor wouldn’t be there.